As a brand new vegan (I made the decision last week to cut out fish, my last big item…WOOHOO! ), one of the most frustrating parts of shopping is looking at a label and not understanding half of the ingredients in a product. What is that 7-syllable word? If I can’t say it, how am I supposed to know if it is an animal product? That’s where my new favorite app, Animal-Free, comes in! Animal-Free is designed for those of us that can’t memorize all of those crazy words but are still trying to live a plant-based life without too much hassle. 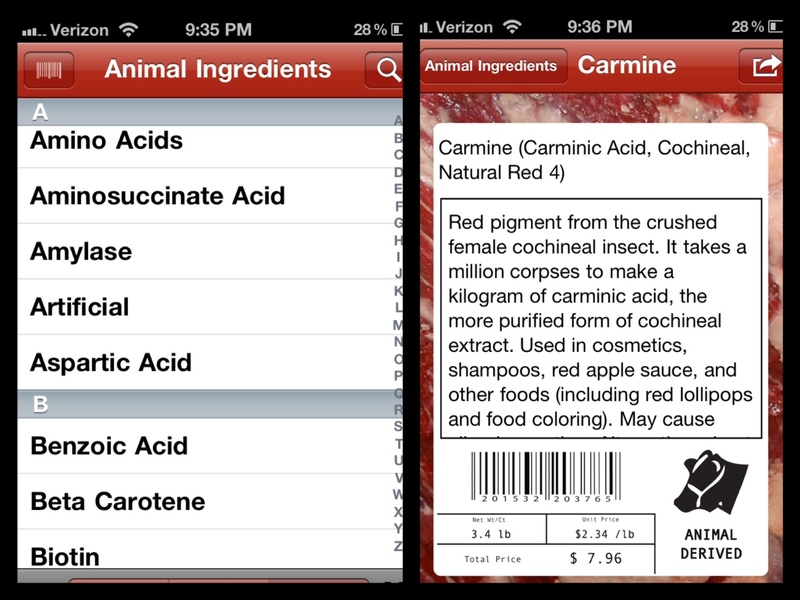 The app contains alphabetical lists of both vegan and animal based products, with an in-depth explanation of each item. Animal-Free even divides animal ingredients into lists that are always animal based (such as bone char) and those that are sometimes animal based (like sugar – cane sugars are not vegan while beet sugars are). There’s even an option to scan a barcode and find a product in the database! When you are looking at the animal ingredients in Animal-Free, you have the option of scrolling through on your own or skipping through the list using the letters on the right side of the screen. When you click on a specific ingredient, you get a screen much like the one on the right panel – the app gives you a detailed definition of how each item is derived (the one I picked has been in the news recently because of its use in Starbucks drinks). I really like that the app gives you some background instead of just a yes/no when it comes to whether an ingredient is animal derived. Learning is a HUGE part of this process for me and I appreciate that the creators took the time to include that information. 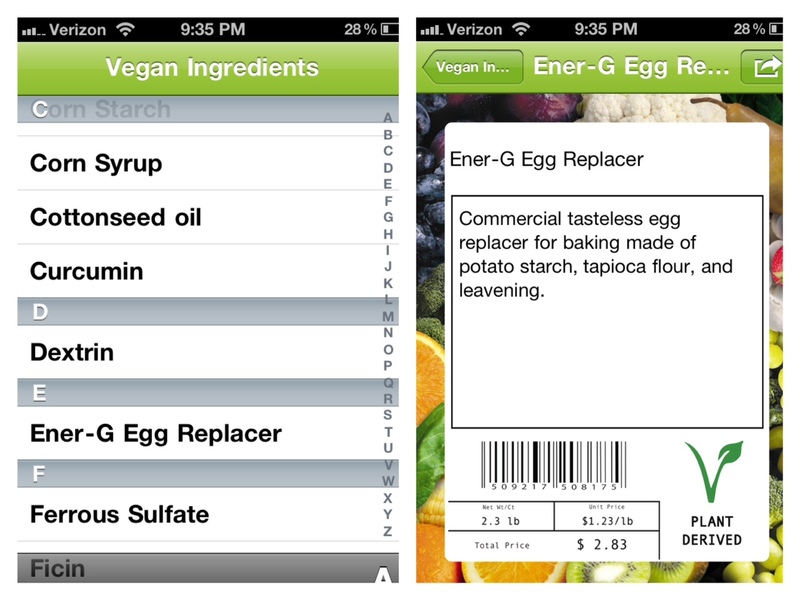 When you hit the “V” at the bottom of the screen, the app takes you to a list of vegan ingredients that you may find on labels. Again, it’s all alphabetized and you get the great description when you click on the item. I’m a big fan of the color scheme that they chose to use – the green really pops and helps convey the fresh and healthy vibe that vegan eating really stands for! Another great feature of Animal-Free is its ability to search the database by both ingredient and product. I found searching by product to be the most helpful – you can type in whatever item you are looking at in the store (I used Daiya cheese as an example) and the app will locate any items that fall into that category. Once you click on the specific item that you want, the app provides you with a screen full of information about the product, as well as if it is vegan or not (ratings are according to user votes). You also have the option to vote to increase reliability of the database in the app. 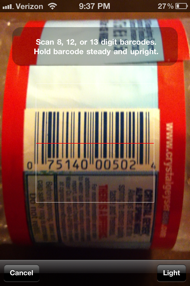 Lastly, Animal-Free gives you the option to scan the barcode of an item. While this is a great idea and could potentially be very useful, the database is not very large as of yet, and I could not locate the test items that I scanned before writing this post. I also really liked that they give you the option to shine your camera’s flash on the barcode to make for easier scanning. I would love to see the barcode feature and database in the app improve in the future because I do think it will be extremely useful to many consumers. Overall, I really liked the functionality of Animal-Free and what it offers to people of all walks of life. Beginning vegans and those that have been at it for a while can benefit from the information found in this app, making it an excellent resource. Currently, Animal-Free is available for the iPhone (there is not an iPad version of the app, but the iPhone version can still be downloaded onto it) and is FREE! If you try it out, please let me know what you think in the comments below! What is your favorite vegan-related app? Please share your finds in the comments section! Interesting App! Will be trying this soon. Is there a Blackberry version of this app please? As far as I know, there is no Blackberry version of this app. Sorry about that! Hmmm….are these items that you make yourself or items that you buy? If the item has a barcode, the easiest way that I can think of is to scan it and if the system doesn’t recognize the numbers, it will ask you if you would like to add that item to the database. Other than that, I don’t see an option to add a product. That would be a great improvement for the app in the future, though! Thanks for pointing me to this app – might be really useful. I just checked (and downloaded ;-)) – there is an Android version of the app, too. Thanks for the comment – so glad to hear that there is an Android version now! Let me know how you like it!